I had a major accident while cooking on sunday. Actually, sunday was a horrible day in general! I was cooking and while trying to open up a cabinet I broke 3 nails (yeah thats a crazy way to break 3 nails). I was extremely upset because I finally was happy with my length and all my nails were practically perfect. And I should have known that something was about to happen because that is the universe’s code to have something go wrong. When things are almost perfect, thats when things go wrong. That day was also the day that my computer crashed and I lost every single file on it. Every file from undergrad and law school and every picture and video. My computer was 4 years old and begging to finally die but I held out hope that I could make it last for a few more months. Finally, when I was studying for my first midterm of my law school career my computer crashed for good. I cried, no joke, and had a mini meltdown and that is why I couldn’t update my blog for a few days. But after my computer crashed and I had to majorly file down my nails, I needed to paint them a color to match my mood. 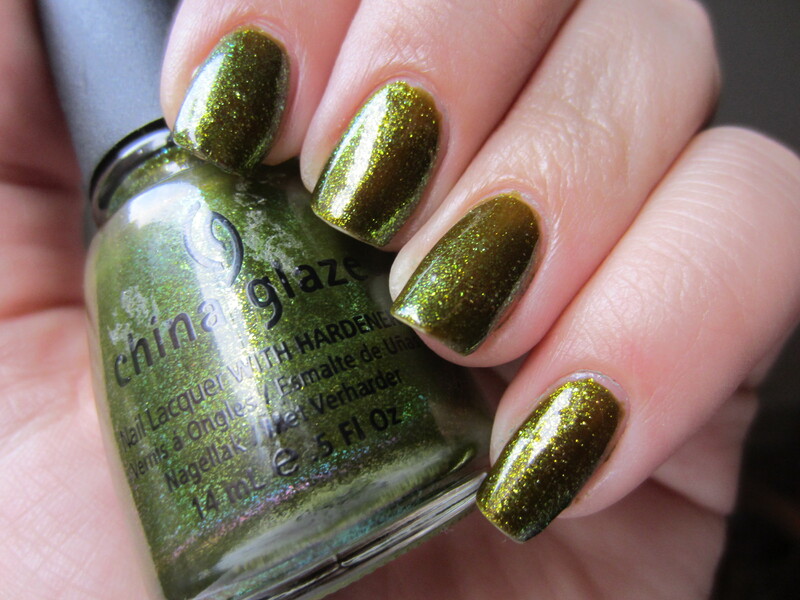 China Glaze “Zombie Zest” is an olive green shimmer that has a brown base. This color in some lights looks like just a brownish olive and then in other lights it looks like a bright glowing green. This color has some serious brightness but at the same time is that ugly pretty type of color. I’m in love with this color because it seems to glow from within but the color within is a brown base. It is so shimmery that it is almost a metallic and is so unordinary that I could never find another color to dupe it. The best part about this color, besides the unique color and the fact that it practically glows, is the name. I’m obsessed with horror movies and anything scary related is right up my ally. This color is a halloween staple and I put it on because 1. Its October 1st this week and the beginning of one of my favorite time of the year and 2. I feel like a zombie with all my studying. The only thing I don’t love about this color is the fact that this is 3 coats and I feel like it needs more. I hate how sheer it is, but sometimes its worth the effort to get this amazing halloween themed color. Excellent post. I be taught 1 thing much more challenging on completely different blogs everyday. It really is going to always be stimulating to read content material from other writers and apply just a little something from their store. Iâ€™d want to use some with the content on my blog whether or not you donâ€™t mind. Natually Iâ€™ll offer you a link in your web weblog. Thanks for sharing. Orly It’s Not Rocket Science is a dupe.